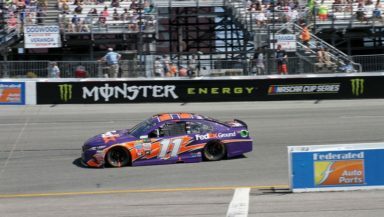 RICHMOND, Va. — Joe Gibbs Racing experienced a mixed bag of results in the Toyota Owners 400 at Richmond International Raceway. Matt Kenseth kicked off the race weekend by taking pole position. He lead from the start to the 164th circuit, winning the first stage, before losing the lead to Brad Keselowski and finishing runner-up in the second stage. With 38 laps to go, however, he and Chase Elliott made contact in Turn 1, leading to his right-rear tire going flat. Kyle Busch ran a more “under the radar” race until the final stage. He made his way towards the lead for a lap and hung around the top-five, but was busted for a commitment line violation under the final caution of the race. Denny Hamlin was the highlight of the mixed bag. He put himself in position with finishes of fifth in the first stage and fourth in the second. He first took the lead briefly under the second stage caution break, but lost it to Keselowski on lap 228. He regained it under the fifth caution with 150 to go, thanks to exiting pit road first, and held it until he was edged out at the line by Keselowski with 113 to go. Hamlin took the lead for the final time under the seventh caution and was passed by Keselowski on the restart with 39 to go. He brought his car home to a third-place finish.